The circuit of Havana’s Malecon was were the two Grand Prix of Cuba were held in 1957 and 1958. 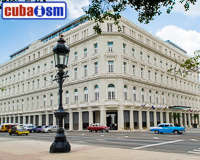 The events that happened there also sped up the changes in Cuban society. It is in this place, popularly known as la Piragua, where Amigos de Fangio meets. The meeting of our club is every Saturday at 4 pm. Our active members present their classic cars and motorcycles which are judged for elegancy and the prize is awarded by a vote of those present. One of the most important activities we have made since our foundation is the creation of a permanent exhibition of ceramic tiles better knows as the Circuit of Fame. It is a tribute to artists, athletes and other persons from Cuba and the world that in one way or another have had something to do with motor sport. They are all Friends of Fangio. Club from Denmark. Made its third appearance in Cuba, with 15 NINBUS motorcycles, exclusive Danish brand as well as five other.